For the first time, ever, the company will control the quality and supply of its Precision Training Tools! New Shooters Save $1000s when compared to conventional methods. What Is Shoot Where You Look? Practice At Home Safely Save time and money by practicing right at home. Gain Confidence It is great to watch a new shooter doing things the Captain of a football team can't do. NRA Help protect our rights and grow the shooting sports. New Shooters learn Gun Safety, Consistent Gun Mount, To Shoot Where You Look, and To Keep The Gun Moving AS the Trigger is pulled. Experienced Shooters correct Bad Habits at home or in the office. What will it do for the Shooting/ Hunting Sports? Learn more.. The first two steps are learned at home or in the office. The Third Step requires a place where aerial targets can be practiced safely. Proper Practice makes Perfect. Practice makes Permanent. Practice wrong things long enough and you may get a trophy one day. It will be for being Consistently LAST! Confidence is built one step at a time. Each step builds upon another. 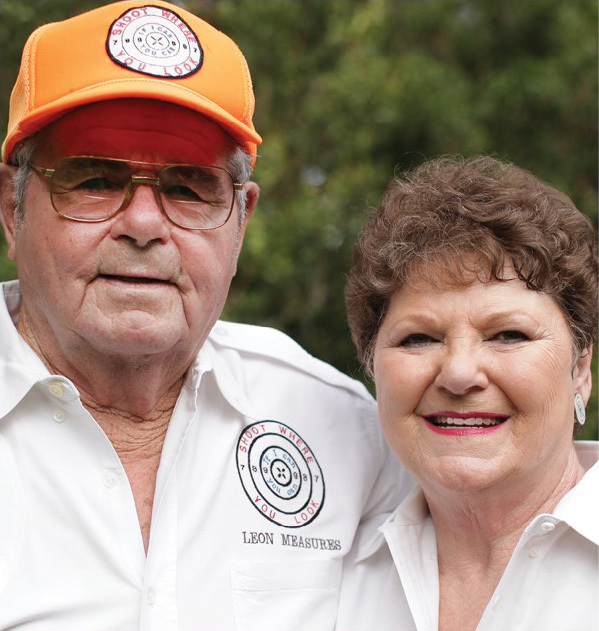 Leon Measures with help from his wife, Frillie, has been training people to be come better shooters for over 50 years. After 10 years of planning and preparation, they are finally close to having their own precision Training Tool to complete the Shoot Where You Look System. The safety record of SWYL is very exceptional and undisputed. I fully recommend his activities for any shooter wishing to start from the beginning or add final touches to heighten their expertise. It is the most sought after training for shooters of shotguns at this time. All in all, this is one of the most exciting programs from one of the most interesting people I've ever met. If your shooting needs some help, give the SHOOT WHERE YOU LOOK ℠ program a try. I cannot describe how much I enjoyed and benefited from your Shoot Where You Look ℠ kit, video and seminar. I learned more from you in a few hours about shooting than in my previous thirty five years of hunting. GUN SAFETY !! NEVER, EVER, POINT A GUN, LOADED, UNLOADED, ON SAFE, OFF SAFE, OR OTHERWISE AT ANYTHING YOU DON'T INTEND TO SHOOT !! THIS SIMPLE RULE ALLOWS THE SHOOTING SPORTS TO PROVIDE A LIFETIME OF SAFE ENJOYMENT ! !